Registration is first come, first served. Or get on our email list for updates of the tournament. 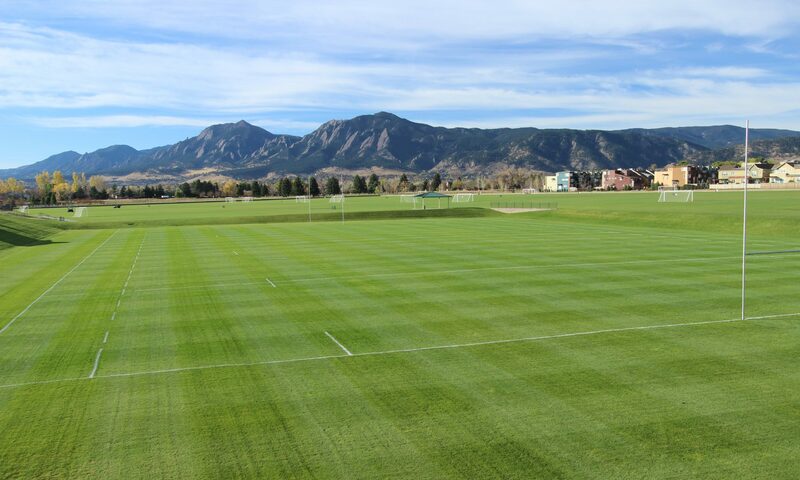 The Pleasant View Fields Sports Complex is the primary outdoor soccer facility for the city of Boulder, Colorado. The fields are truly outstanding. If you have ever played in a tournament where you were assigned a dirt, rocky, or undersized field, you know it can ruin the fun. In our augural tournament in 2017, participants gave the fields a rating of 4.83 on our five-point scale where five equals “outstanding”. The facility contains eleven grass fields used from March through October, sparing the fields the tough winter conditions in Colorado. The sand base creates excellent drainage for when it does rain in Boulder. The complex was awarded the 2015 National Sports Turf Managers Association sporting grounds field of the year and the Championship Field (field #1) was awarded the 2015 Colorado Sports Turf Managers Association – Rocky Mountain “Sports Field of the Year”. There is not a bad field to be drawn. We will have a pre-tournament party at Gravity Brewing in Louisville on Friday evening, allowing teams to get together and meet other players. On Saturday we will have a food truck at the fields. Cuban Fusion will be selling eats based on owner Lisa Angelo’s unique worldview, Greek background, and love of Cuban food. We will have a Beer Share event in which teams are encouraged to bring and share canned beer from their home town after their final game on Saturday. This is a great way to meet fellow players and foster a feeling of community. The tournament location itself is a major attraction. Boulder, Colorado is consistently voted one of the nicest, most livable small cities in the United States. The city of 100,000 people is known for housing the state’s flagship university (University of Colorado at Boulder), having a vibrant high-tech based economy, and being home to the downtown Pearl Street Mall, full of shops, restaurants, and nightlife. Nestled at the base of the Rocky Mountains, Boulder draws all sorts of visitors and residents interested in the outdoors. Boulder is also home to dozens of outstanding restaurants, 40 breweries in the county, and 21 marijuana retailers. We have negotiated deals with three local hotels out of the many from which you can choose in Boulder. We highly recommend you consider staying in Boulder overnight, even if you are coming from as close as Denver or Fort Collins. It makes the tournament weekend much more fun! Our three hotels are as follows. The Millennium Harvest House Hotel is nicely located on Boulder Creek with a beautiful back lawn. It is only a mile from Pearl Street Mall in central Boulder. The rooms are hit and miss as not all have been recently updated but our $129 price is almost unheard of for Boulder in the summer. You can reserve your room online or by calling 800-545-6285. Deadline is June 26. The Holiday Inn Express is in North Boulder, one of the hipper neighborhoods of the city with good restaurants and bars (plus a brewery and winery) within walking distance. It is also only five minutes from the fields and you can take a fast Uber to central Boulder. Our negotiated rate is $159, which includes breakfast, and you can reserve this online or by calling 303-442-6600 and using the code RMS. Deadline is June 26. Hampton Inn & Suites North is also only five minutes from the fields but north, in the direction of Longmont and away from Boulder. Breakfast is included, the rooms are good, and there is an indoor pool, all of which helped to make this the #3 hotel in Boulder on TripAdvisor. Our rate is $189 and you can reserve this online or by calling (303) 530-3300 and using the group code RMS. Deadline is July 28. Team fees for the 2019 Rocky Mountain Adult Soccer Tournament are $850 through June 30 and $950 if paid July 1 or later. The fastest and easiest way to register is online with a credit card. There is a small additional processing fee that will be added by the processing company. Alternatively, you can print, fill out, and mail the registration form with your check to 2330 Broadway Ave #704, Denver, CO 80205. Please note your registration price is based on when we receive your payment, not when you send it. All payments are non-refundable once made. If you are looking for players to fill up your team or are a player looking for a team, please post a comment on our Free Agents board.